Children with developmental disabilities are not all the same and neither are their toileting difficulties. Toileting problems can have a number of different causes and as a result require a range of approaches to manage and resolve issues. 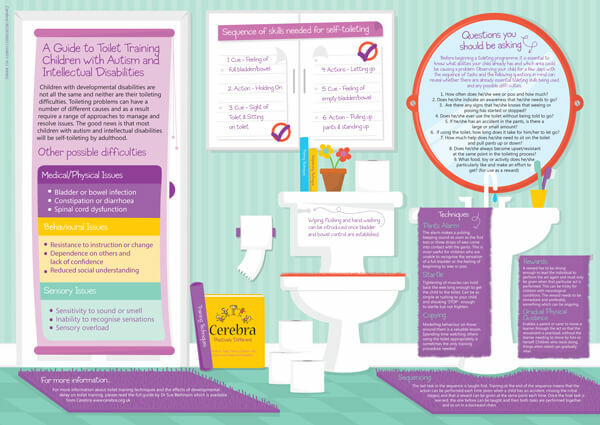 Children with neurological conditions can sometimes find learning to use the toilet more difficult than typically developing children as the result of physical, behavioural or sensory differences, as well as the learning difficulties which are part of their developmental disability. It is important to note that the majority of individuals with intellectual difficulties will become self-toileting by adulthood. (Please note, this information deals with daytime wetting and not bedwetting or night-time enuresis). You can download the guide below. First published 2012. This edition 2015. Review date 2018.